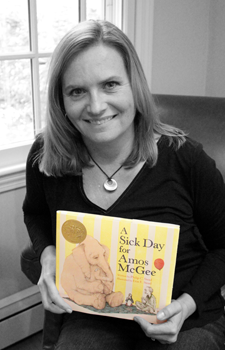 A Sick Day for Amos McGee (Roaring Brook Press, 2010) is recommended for ages 2-7. Be sure to check out these books by Heather Lang: Queen of the Track: Alice Coachman, Olympic High-Jump Champion, illustrated by Floyd Cooper (Boyds Mills Press, 2012); The Original Cowgirl: The Wild Adventures of Lucille Mulhall, illustrated by Suzanne Beaky (Albert Whitman, 2015); and Fearless Flyer: Ruth Law and Her Flying Machine, illustrated by Raúl Colón (Calkins Creek, 2016). If you are on Twitter or Facebook, find Heather Lang at Twitter.com/hblang and Facebook.com/Heather Lang.